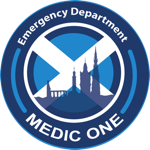 The amazing medical education team from @edinburghEM today launched the start of an exciting new project, changing the way we teach our medical students and each other. Here's a note from Katy and Jon whose enthusiasm and hard work have brought this project into the world of FOAMEd. As of Monday 27th April, learnED is officially live! For those that don't know, learnED is a home-grown online resource of educational stuff relevant to emergency medicine, suitable for nurses, doctors, students and anyone really. We hope that it will grow over time to be a useful source of material for exam prep, general ED knowledge and clinical skills. It is built around a new way of providing teaching to our medical students allowing us to 'flip the classroom'. We would love some feedback from you - please let us know - good or bad! It's a bit of a work in progress right now, so your feedback would be appreciated. If you are keen to get involved and contribute to learnED then get in touch with us - there is lots more to do. I'd like to say a huge thank you to everyone who has contributed to learnED so far, we've been really impressed with the work done by all of you. Special thanks to Janet, Dean, Craig Davidson, Suzi Mac, Craig Walker, Dave McKean, Nicola DiRollo and Ed James.